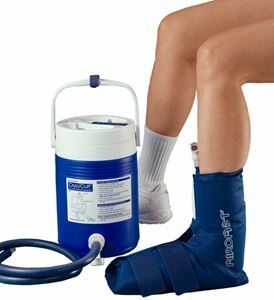 Aircast Ankle Cryo/Cuff with Motorized Cooler contains the Integrated cooler along with the Ankle Cuff. This system can be used on ankles for post operation therapy, trauma, home or athletic training. Research proves that compression & cold therapy helps in quick & prolonged relief for injuries. Cooler can hold cold water/Ice for 6-8 hours making it easy to maintain during the use. Aircast Knee Cryo/Cuff can be used alone as Only Cryo/Cuff or with a Motorized or a non Motorized Cooler. Bought it to get rid of my manual one! I already have a shoulder Cryo/cuff and as I liked the product, this time I ordered ankle Cryo/cuff as I sprained my ankle badly. I should say all of these are working really wonderful..
Great Website, Great Product. Fast Shipping and good shopping. My overall experience was great. Hope to buy more products from them if needed. I have been using the ankle cryo cuff w/cooler for 6 months. I have started using it post surgery of my ankle. Compression and cooling effect cured the injury. This cryo cuff fits the ankle properly and provides cryotherapy. Best product for post surgery swelling and pain. I used this product after my ankle surgery and I am very pleased with it. Its been 3 weeks past the surgery and it has made a huge difference. I am in a comfortable and relaxed position. I will continue to use it as it works amazingly on pain as well as swelling. All thanks to this wonderful device. My son fell from his bike and broke his ankle which had to be operated. I have already purchased a knee cryo cuff from them which I am using and is perfect for my pain and recuperation. This time I ordered the ankle cryo cuff for my son. It is yet to arrive but I am sure it will arrive as early as my last order and in perfect condition. I received my device to lower swelling in my ankle from an injury. I told the customer rep how much pain I was in and how could I receive it as soon as possible. I received it the very next day. I have been using it all of the time and it is wonderful and very helpful. Your customer service repre was awesome and the product was amazing and I wanted to thank you for getting that to me right away. Great quality, reliable, efficient product. Service was great and fast, I was looking forward to an email regarding shipment and it arrived, which was simply awesome! I love their products and service quality and will definitely buy again. Had heard a lot about this unit and finally bought it. Ordered 2 day delivery and ordering was pretty easy. Got free shipping and even got a promo code which made my purchase even better. I am now waiting for the unit to arrive in the stipulated time period so that I can come back with another positive review.